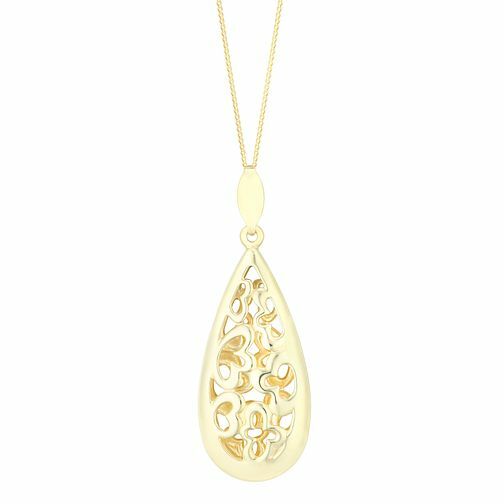 Crafted in classic 9ct yellow gold, this distinctive pendant features intricate cutout detailing for an eye-catching finish. Wear alone for understated glamour, or team with coordinating accessories for maximum impact. 9ct Yellow Gold Curve Cutout Pendant is rated 4.0 out of 5 by 1. Rated 4 out of 5 by Anonymous from Very effective pendant Really like the pendant part of this, it is lovely cutwork effect but only concern is the chain is very delicate compared to pendant and looks very easy to break. Would have liked a bit more substantial chain.